Curb Appeal: Date night becomes simpler with parking available behind the restaurant and in a nearby lot. Where Veggies Meet Steak: Chef John Amato earned a reputation for outstanding vegetable dishes at The Park Café. Goodbye, Grits: The shrimp and farro starter nestles fresh radishes, asparagus, peas, and herbs within a hearty serving of the nutty grain. 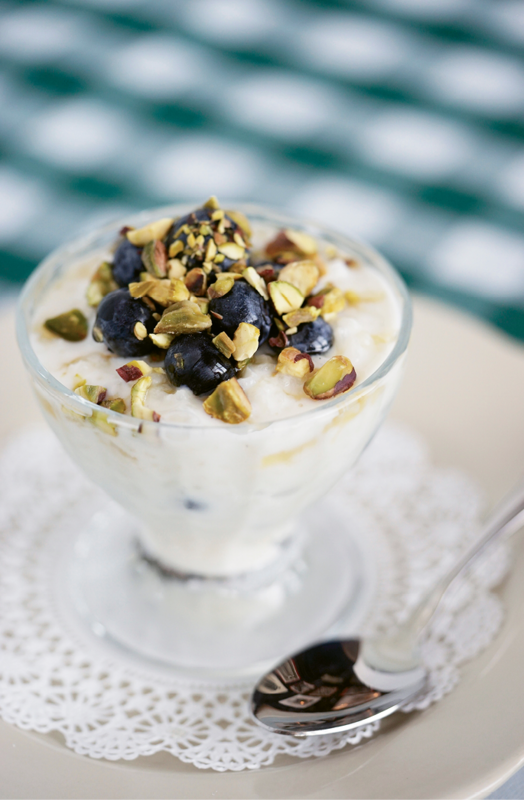 Old-School Charm: Rice pudding with fresh fruit and nuts hints at earlier decades. Double Down: Little Jack’s Double Tavern Burger is a welcome addition to the menu. 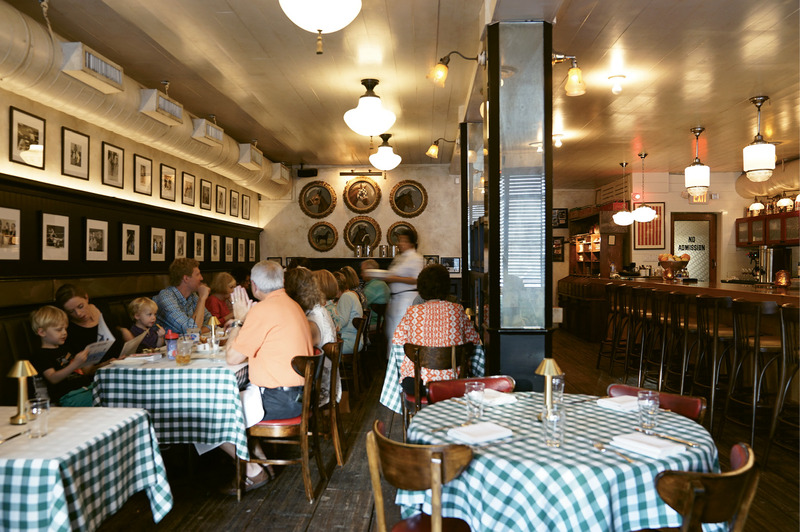 Retro Chic: The interior décor hints at classic taverns and old-school eateries. Restaurateur Brooks Reitz is a bit of a magician, able to convert nondescript spaces into seemingly timeless venues. Leon’s, his first venture with business partner Tim Mink, morphed an old autobody shop into a bustling den of culinary cool, the kind of place that makes you feel hip just by entering. Next came St. Alban, a windowless cement-block warehouse transformed into an ultra-trendy, light-filled coffee shop. Bit by bit, Reitz and Mink scattered tasty crumbs up King Street. People followed, venturing into territory above Calhoun Street—and north of the Crosstown—where, in the not-too-distant past, there were few dining establishments. Then, abruptly, St. Alban closed (or at least was shelved for relocation, we hope). And in its place sprung Little Jack’s Tavern. Yet you’d never know the restaurant’s previous incarnation; the only vestige is the expansive blonde bar-top and gorgeously rough-hewn thick wood flooring. The stage has been reset to reveal a darker, cozier tavern offering classic cocktails and affordable steaks from lunch through late night, seven days a week. By day, sunlight filters through west-facing blinds, casting patterns on green-and-white checkered tablecloths as patrons bite into juicy burgers and creative salads. Servers don crisp shirts, green ties, and long white aprons, a nostalgic touch reinforced by a sound track of quintessential crooners (martinis tend to reach an ethereal level when you’re listening to Sinatra or Ella Fitzgerald). Intriguing black-and-white framed memorabilia line the darkly stained walls. The inclusion of kennel club photos and equestrian portraits begins to make sense if you factor in Reitz’s upbringing in western Kentucky, where he accompanied his grandmother just across the Ohio River to dressy dinners at a members-only supper club that doubled as a kennel club. One could easily presume that Little Jack’s Tavern springs, in part, from Reitz’s affection for tried-and-true vintage eateries. But no matter the genesis, we came for the food. And the ambiance only heightens the charm of its very promising menu. Start with the warm cheese puffs, airy little Parmesan and Gruyère-laced orbs baked to a popover consistency and served with a boursin-based, chive-laced sauce for dredging. You could, in fact, frequent Little Jack’s for the cheese puffs and cold brews alone, or for cocktails and bar nuts, but you’d be missing out. 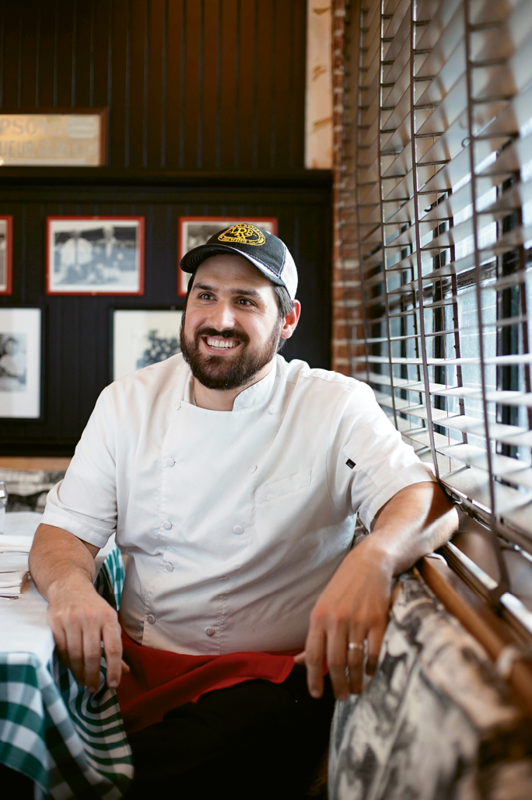 Executive chef John Amato sharpened his skills in the kitchens of FIG (where he first worked with Reitz) and later The Park Café, where he earned a reputation as something of a veggie whisperer. At Little Jack’s, his crea-tivity shines in such combinations as his newly introduced baked egg dish swimming in celery root cream dotted with prosciutto and English peas. Or in his toothsome steak tartare, moistened with a classic British hot sauce and topped with tiny potato sticks for crispy contrast. The tartare’s threaded with herbaceous flat parsley, salty pops of capers, and crunchy shallots—all as delicious as the dish is beautiful. 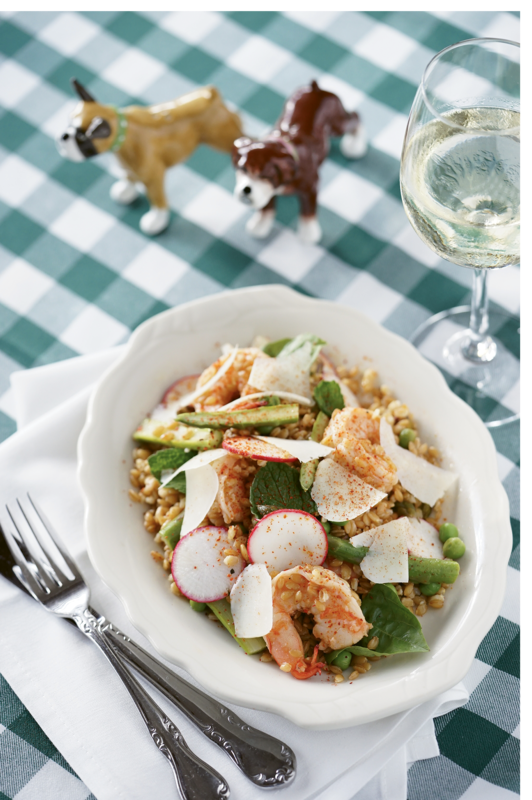 His shrimp and farro salad marries nutty grains with shreds of mint, asparagus, radish, and pistachio, brightened with just the right touch of lime and topped with large, meaty shrimp. And speaking of the crustaceans, Little Jack’s shrimp burger tastes of pure ocean. Simply seasoned hunks of shrimp mixed with an herbed mayo form a gold-battered “shrimp cake” sandwiched in a pliant bun, an excellent go-to for Lowcountry lunch. Like any conscientious new establishment, Little Jack’s is making tweaks. They’ve revamped the burger (which previously verged on gargantuan, dripping with rich Casatica di Bufala cheese) into a more manageable Double Tavern Burger, a marked improvement. 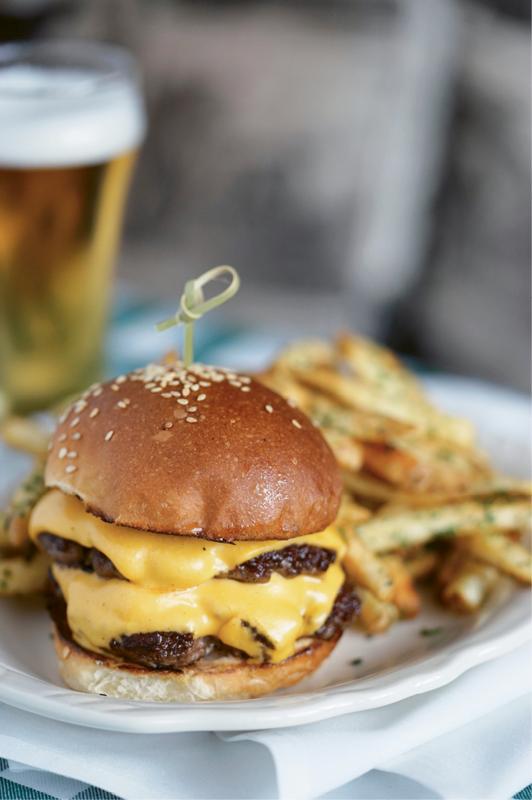 Many prefer the signature single Tavern Burger: reasonable both in size and price, delicious, and quite filling when paired with garlic-and-herb-flecked fries. At night, Little Jack’s iconic “kissing canine” salt and pepper shakers are replaced on each table by individual brass lamps, casting a warm glow as the playlist switches from golden oldies to classic rock. (The shakers are still available by request after 4 p.m.) Diners who wish to bypass the more boisterous mood of the front hall can snag quieter tables in the back, splurge on richly marbled slabs of rib eye, and wash them down with robust Italian or Spanish reds. As for dessert, options are limited: a rice pudding with seasonal toppings and chocolate cake. Both are sweetened with restraint, so if you were hoping to sail out on a sugar high, you’d do better to order a brandy. My rice pudding came topped with fresh blueberries and pistachios, its silky milk base infused with cardamom, a delightful combination whose subtlety was overshadowed by the stronger, saltier flavors of my preceding meal. Later at night, light from within Little Jack’s casts austere shadows on the darkened streets of Upper King, channeling the minimalist aesthetic of an Edward Hopper painting. 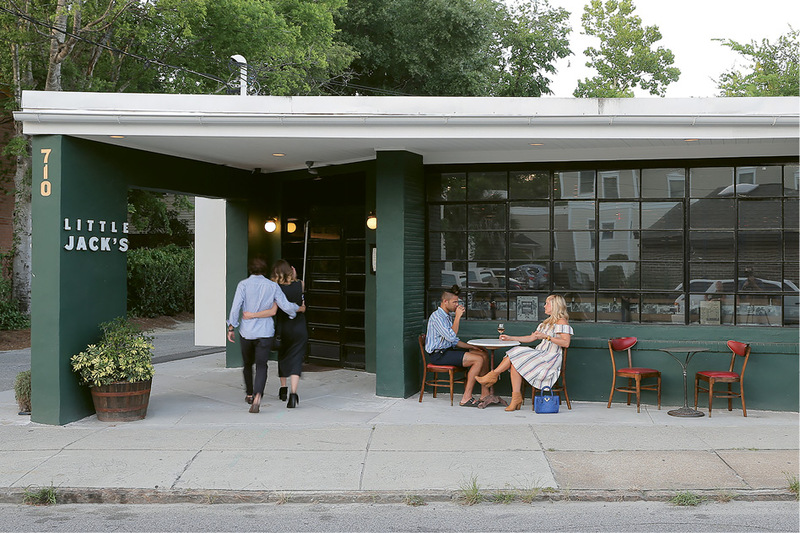 Little Jack’s is a throwback indeed, its fresh cuisine a draw—and Charleston is better for it.